Gardens are special places and are an important extension of the home. We can help you enhance your garden in a unique way by using glass as a design feature. All are bespoke and so are one off pieces to be cherished. We use glass, wood, metal and stone, or any of the materials together or separately. 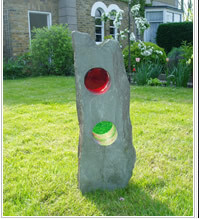 The sculptures are all totally individual and made of the finest hard wearing materials. We will help you decide what might suit your particular outside space and if you wish will come and fit it for you.